If you want to share your mobile network with other devices you can set up your Huawei phone as a Wi-Fi hotspot. Having problems while sharing your mobile data? Let us know in the comments. Happy to help! Open your Settings and go to Wireless & networks > Tethering & portable hotspot > Portable Wi-Fi hotspot > Configure Wi-Fi hotspot. Set the network name, encryption type and password. Save it and you are ready to use it! Go to Settings > Data limit > set a data limit for a single session. With a set data limit other devices won't have unlimited access to your hotspot data. When the data limit is reached, your device will disable the Wi-Fi hotspot. Want to use a USB cable to share mobile data? Go to Settings > Wireless & networks > Tethering & portable hotspot > enable USB tethering to start sharing your mobile data with a computer. 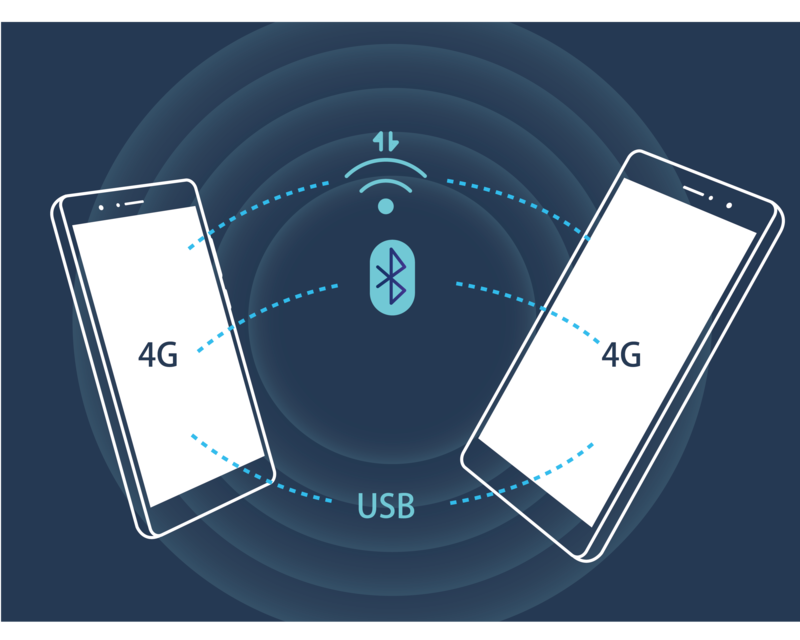 Want to use Bluetooth to share mobile data? Enable Bluetooth on both devices and pair them. Open Settings > Wireless & networks > Tethering & portable hotspot > enable Bluetooth tethering and start sharing your mobile data. This no longer works since I upgraded to android 8. Is there any solution or are we all waiting for Google to fix this? Hi @Ruc. Which part no longer works? The hot spot, data limit, USB tethering? Not tried USB, but hotspotting with WiFi or Bluetooth both fail. The other device finds and connects to the hotspot but I cannot do anything else. Cannot get to any website etc. . I swapped my sim into my old phone and all is well there so it seems to be this phone. Your sim provider may have not provided data sharing with your contract. Have you tried forgetting the network on your laptop. Or you could try changing the network name. @Lifelust changing the network name looks to have resolved it. I would have never thought to try that. Thanks very much for all your help, this has been a real pain for several weeks! I'm glad. Isn't it lovely when an issue gets sorted. 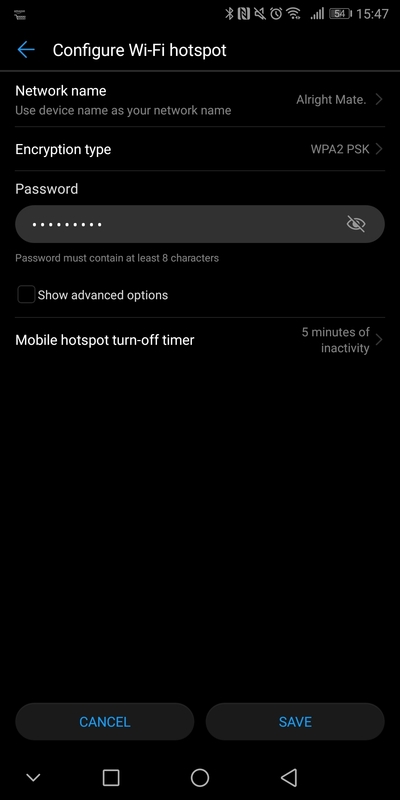 Everytime my hotspot is active, I can't use data on my device p8 lite. No other Android device that I've used has ever has this issue with a mobile hotspot. Sorry to hear of the situation. Have you tried doing a network setting reset to the device? To do a Network Setting Reset, you simply have to go into Settings- on top there is a search bar - just search for the word "Reset". Among the search results presented there will be Network Reset. It will ask for a confirmation and then proceed. Afterwards just restart the device and test the hotspot. I have recently bought this phone and having issues with internet hotspot. Both from the same network Three UK. Internet works fine on the phone , but as soon i switch on the hot spot on the phone , the internet stops working on the phone. While the internet is working fine on the hotspot connected devices. I ringed Huawel Tech support and they said it is an issue with APN settings , so try to ring three. I spoke with Three and have reset the APN settings to new and still no luck. Can some one guide how can i resolve this issue. The Andriod is software is fully updated. I moved your question to this topic. In the comments above, another user addressed the same issue. Please see Max's reply above and let us know if resetting the network settings helped. Thank you for the swift reply. Sorry to see that this didn't work. I will ask Max to assist you in this thread. I am having the same issue, on Vodafone and the sim works in another phone, I have tried resetting network settings and still no luck. Any help would be appreciated. Could you kindly provide me with the model of your devices so I can look further into this? Thank you for providing me with the model of your device! Would you be able to PM me in private with the Serial Number of your device to inspect this further? Hello Ami. I bought a Mate 20 Lite the last week and I'm forced to use the same name for the WiFi sharing and for the Bluetooth networks. It's a bit annoying as in my previous phone (Nexus 5X) I was able to set different names for them. Is there a way to "dissociate" these networks and set different names for each one?